Two types of apples, smothered in a cinammon-sugar-ginger-butter sauce, mixed with crunchy gingersnap cookie pieces, and layered with thick and creamy vanilla yogurt. This surprisingly rich dessert (well, I had it for breakfast) is almost too good to be true! 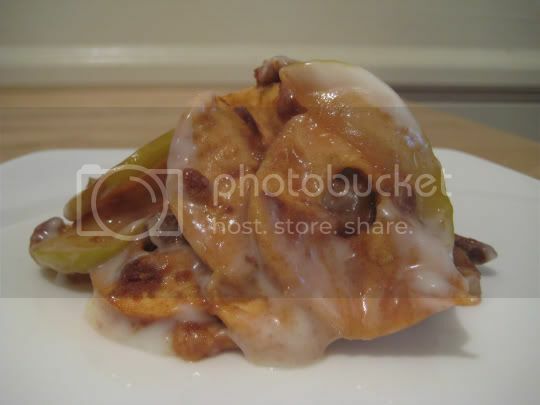 I used Granny Smiths for their tart and crisp texture, and dried apple slices for a sweet chewiness. I couldn't believe how good the kitchen smelled as this cooked. There are three levels of ginger used in this recipe (so ginger-haters, beware): fresh grated ginger, crushed gingersnap cookies (which became these delicious, nougatty, and candy-like in texture), and candied ginger pieces, all added to the apple mixture during cooking. Then there's also the layer of crushed gingersnap cookies at the bottom of the dish. I could definitely feel the heat from all the ginger, but I also couldn't stop eating it. The addition of vanilla yogurt gave the dessert a nice creaminess, which added even more sweetness and acted as a sort of cream sauce for the apples. Perhaps best of all, it was extremely simple and quick to make.